It may depend on culture and nationality, but the subject of child kidnappings is usually not one that is chosen as the central theme in a comedy picture. This is not the case for Dave McCary’s Brigsby Bear. The almost satirical adventure comedy is beyond what can be expected prior to a screening, but once all is said and done it can be confirmed that Brigsby Bear is a seriously funny film. The movie opens on a young man named James (Kyle Mooney). He is in his bedroom watching a VCR of a children’s cartoon titled The Adventures of Brigsby Bear. Unknowingly living with the family that kidnapped him, his is a secluded life, and throughout the initial scenes a number of questions and diversions are thrown at the audience to keep them guessing who, what, where, when and why. In a sudden turn of events, James finds his life torn apart and reassembled for him, and with only the memory of his childhood idol Brisby Bear for company, he must learn to adjust to his new surroundings by embracing his creative instincts. There is little emphasis here on the sheer horrific fact that the protagonist was actually kidnapped as a child – something that is every parent’s nightmare. Actually, Brigsby Bear is a journey of adolescence and discovery in which the only relationships that matter are the ones that James chooses to make. The film humours the fact that he lacks any social understanding of the real world through a number of scenes that would certainly be a lot darker should there not be a punchline. The concept is disturbing, but fits perfectly into the style of the movie – and it is easy to forget that James has been held captive throughout his upbringing. To achieve this must be considered a success, and McCary treads the line effectively between a dark drama and just plain silly, whilst also maintaining some genuine laugh-out-loud moments. This is not the most predictable of films, and this actually works in its favour. The plot could be all too obvious when focused on a social outcast, yet Kyle Mooney’s character is wonderfully oblivious to anything other than his new friends, and Brigsby Bear of course. 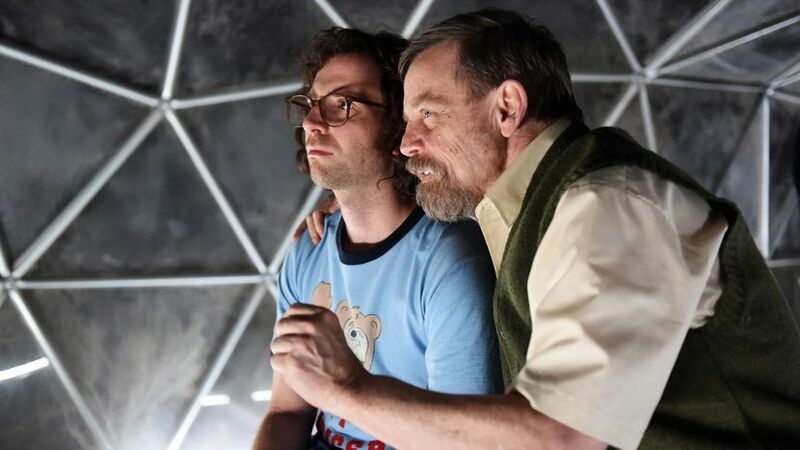 Mark Hamill is intriguing as James’s “Fake Dad”, and it’s a shame he doesn’t receive as much screen time as some may have liked. Creative minds can blossom when given the opportunity. If it fits your sense of belonging, anyone could create their own Brigsby Bear film with a group of similar-minded friends, like James. It does of course help to be living pretty close to beautiful mountain ranges. Brigsby Bear is released nationwide on 8th December 2017.